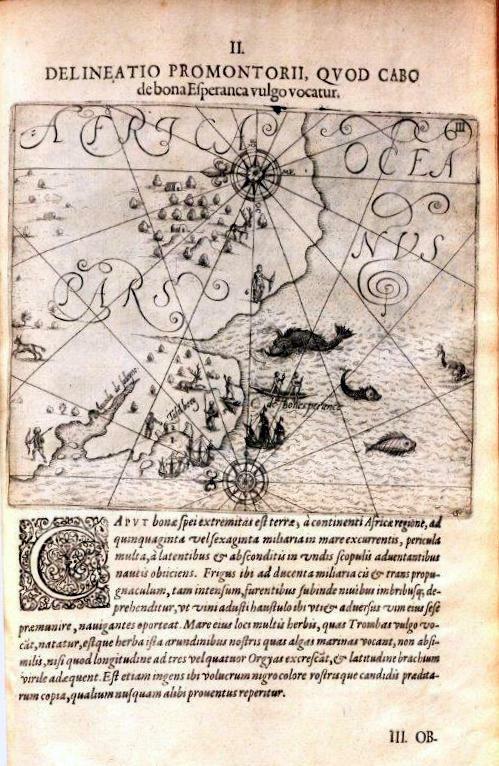 One example of a nautical textbook from the original Spanish (Breve Compendio de la Sphera y de la Arte de Navegar) is the treatise, The Arte of Navigation, by Martin Cortes, Spaniarde, Englyshed out of Spanishe, by Richard Eden. First printed in 1561 by Richard Jugge, the treatise became popular and there was a continual market for the text. The Dibner Library has a well-worn but carefully conserved copy of a later edition, of 1584. The title is within a woodcut ornamental border, there are pictorial initials (capital letters at the beginning of sections), side-notes to the text in the outer margins, illustrations (such as of an astrolabe), and volvelles (devices in circles with moveable parts). There is a lot to engage the reader, including practical information in tables, charts, and a compass rose, all important aids in tracking a ship’s position and speed and setting a course. This was not a simple book for a printer to produce and there was need for accuracy, particularly with the numbers. 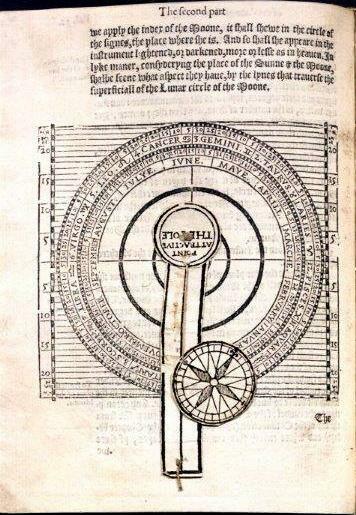 A volvelle in The Arte of Navigation with remains of the original string pivot, which doesn’t often survive the ages. 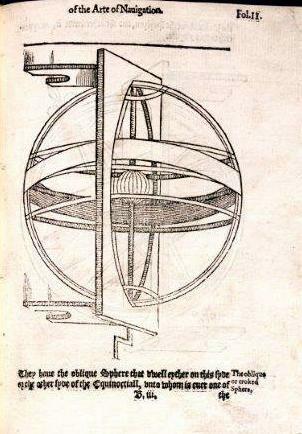 Such a device could be used to help calculate movements of the stars, the tides, and the calendar. Women printers, booksellers, and publishers (the roles were not closely delineated and could be interchangeable) in the hand-press period were not all that uncommon. Nuns were known to set type at convents under a press’s manager (such as for the Ripoli Press in Florence). Although they were not allowed in the apprenticeship system, females learned and worked alongside husbands (partners both in home and trade), fathers, their own young children, or journeymen. Inherited businesses at the death of the “master” provided women the opportunity to be in charge in managing the printing house. The Arte of Navigation would have been a money-maker, providing a reliable source of income. 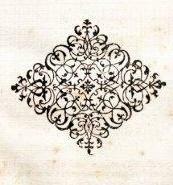 Indeed, Joane Jugge first issued this work herself in 1579. The Smithsonian Libraries in their Special Collections has more examples of women printers from the 16th and 17th centuries, with evidence of their contributions in the early hand-press period. These books are in a range of subjects that reflect some of the focus of research in the Smithsonian museums—natural history, physical sciences, numismatics, travel, military history, and the art of warfare. We have only recently consistently traced printers’ names in the online catalog, but general word searches of “widow” in various archaic spellings (widowe, wydowe) and other languages (viduae, veuve) brings up various titles. The Coignard family were the official printers of the French Academy. Following the death of Jean-Baptiste Coignard in 1689, both his widow and son succeeded him and continued with the appointment of Printer of the King of France. 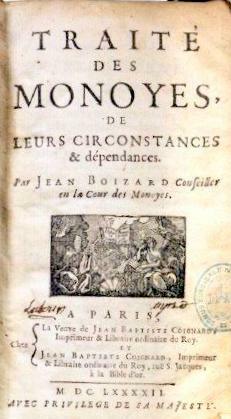 The Dibner Library holds Widow Coignard’s Traité des Monoyes, de leurs Circonstances & Dépendances (A Paris: Chez la Veuve de Jean Baptisté Coignard, imprimeur & librairie, 1692), by one of the founders of numismatics (the study of medals and coins), Jean Boizard. As with books on navigation, texts on money and accounting were also profitable for the book business. The Widow Coignard’s Treatise on Currencies, their Circumstances and Dependencies was a bestseller. In fact, the work was republished into the 18th century when it was eventually banned by the Government for being too accurate in its description on how coins are made. Matthäus Becker’s widow had a hand in the wonderful Indiae Orientalis Pars IX of 1612-1613. The main title page of this account of the Dutch voyage of 1607-1609 to the Spice Islands—Indonesian islands of the Malay Archipelago—states that it is from the printing house of Wolfgang Richter (who died in 1626); the additional, added title pages credit the “Typis Viduae Matthiae Beckeri.” Another book of travel and exploration in our collections, an account of a journey to Spain, has both a woman as author and as bookseller; Madame Marie-Catherine d’Aulnoy’s Relation du Voyage d’Espagne (A Paris: Chez le Veuve Claude Barbin, 1699). From Barbin’s death in 1698, his widow continued both as printer and bookseller until 1708. Illustration in Indiae Orientalis Pars IX. Not a great example of printing (the copper plate engraving and text, run through the press separately, don’t align well on the page) but who can resist a map of cavorting sea monsters, sailing ships, two compass roses, and stand-up paddlers in a canoe? Not all female printers labored under the name widow. A book about the voyages of Jean-Baptiste Taverneir to Vietnam and Japan, A Collection of Several Relations & Treatises Singular and Curious was printed in London in 1680 by “A. Godbid and J. Playford, for Moses Pitt.” Anne Godbid and her husband’s former apprentice John Playford the Younger took over the business jointly after William Godbid’s death. Together at their printing house at Little-Britain in London, the partners specialized in music and mathematics texts—along with travel books, all difficult, labor-intensive productions. There are, no doubt, more examples of women who contributed to 16th and 17th century book production in our collections, waiting to be discovered, investigated, and described. Some remain hidden, as not all books disclose who the printer was, particularly of seditious, contraband, or nonconformist material. The imprint revealed to legal authorities who was responsible for the production at a time when one could be imprisoned for printing a book considered treasonable. But with research and diligent bibliographical work, such names can be brought to light, aiding research on women’s work and not merely providing anecdotes. There should be a continuous chronicle of women in the early trade. In the meantime, the books as artifacts are testaments to their labor. Gabriel Daniel. 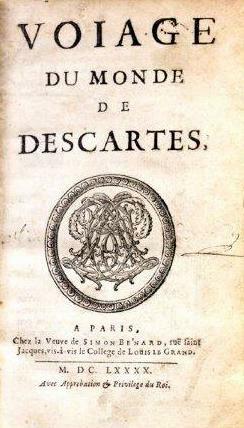 Voiage du Monde de Descartes. Paris: Chez la Veuve de Simon Bénard, 1690. 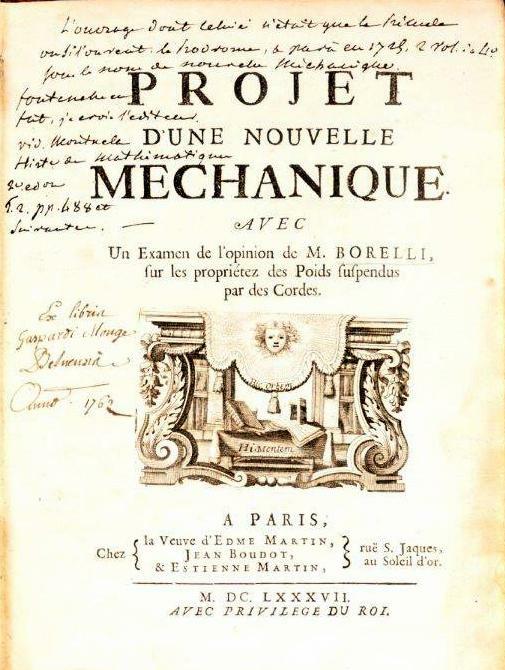 This work, a refutation of Descartes’ theory of vortices, may have a fictitious imprint, possibly printed in Amsterdam (link here). Francis Malthus. 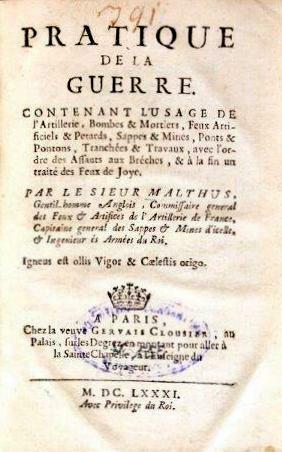 Pratique de la Guerre (Practice of war containing the use of artillery, bombs & mortars) A Paris: Chez la Veuve Gervais Clousier, 1681 (link here). Another example of the art of warfare: Dalicourt. La Campagne Royale, ou, Le Triomphe des Armes de Sa Maiesté ès années 1667. & 1668. 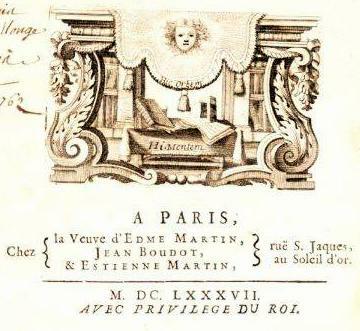 A Paris: Chez la Veuve Gervais Alliot, & Gilles Alliot Son Fils, 1668. Jacques Rohault. Traité de Physique. 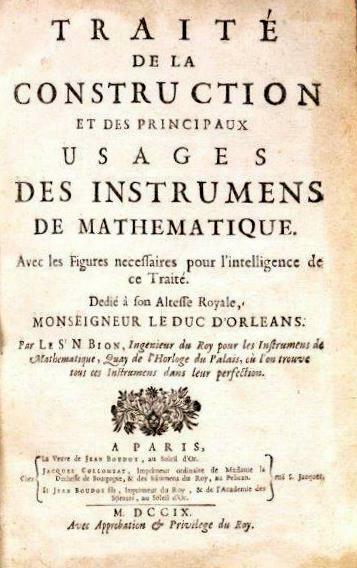 Paris: Chez la Veuve de C. Savreux Libraire Juré, 1671. Madame Savreux printed and sold her wares near the Cathedral of Nôtre-Dame. The widow of Edme Martin is one of the few early female printers with documented birth and death dates, 1618-1670. The title page of the Dibner Library’s copy has wonderful provenance information, marks of previous ownership. This was a very enlightening blog. Thank You!